Bought 10lbs of belly the other day. Was happy to see it came in 2 5lb pieces. Decided on Harry's maple bacon for my 1st go. 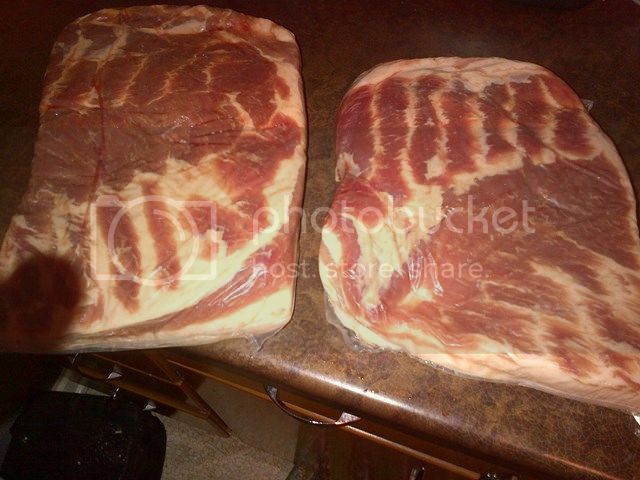 Each piece of belly got 3.75 tbs of salt and home made maple sugar along with a level tsp of cure #1. Rubbed them down and into 2 gal freezer bags. Each bag then got approx 3/4 cup of real maple syrup. Put it all together the 17th and gonna smoke the 27th in the Bradley. Thinking some apple will do the trick. My 1 ? Is how long you guys going with the cold smoke on the maple variety? I try to go 10-11 hours, with very heavy smoke. Not black nasty putrid smoke, just a thick good smelling smoke, and for my maple bacon, I use maple wood, not really for any special flavor, just because it gives me a monster coal bed that last forever. Thanks Harry. I was hoping to do about 10hrs. I have read other posts of some smoking for 16+ and wasn't exactly looking forward to having to sit at home and do nothing all day because I was smoking bacon. Nor did I want to get up early to put it on during my only days off for the next 3-4 months. Sleep is becoming a premium this time of year. Well, Smoked it up on the 27 with 8hrs of apple. Had to cut it down from my planned 10hrs because of a holiday party but it turned out great. here are some pictures. Smoker all set up. It got to a scorching 42 F that day so running the puck burner alone took me to and kept me at 106F in the cabinet. Another piece squared off and ready to slice. Bought a cheap slicer as a backup for my mechanical slicer. Was glad I did as the mechanical one was not big enough to accommodate a piece of belly. Gonna have to figure something out for next time on that. Overall it turned out good. I learned a lot and will def make more in the future. There are some things I want to do different. 1) find meatier bellies. I used some frozen boxed bellies from a retailer here in town. I was not impressed with the yield I got out of them. I know they should be fatty, but nearly 50% of the 10lbs of belly was unusable. 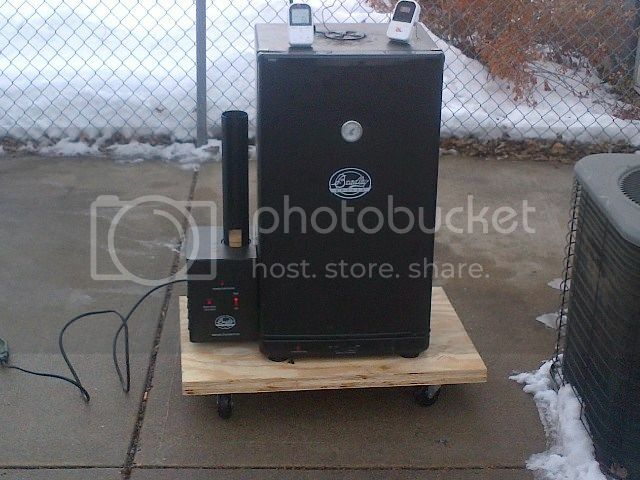 2) thinking about getting a tube smoker to fill with pellets. The smoke flavor on this wasn't bad or anything, I just want a way to keep the temp way down regardless of the temp. 3) figure out a way to use my mechanical slicer. The knife worked ok. but when u are cutting that many slices, a slicer sure would be nice. 4) get slabs COLD COLD COLD before slicing. I rested them in the fridge for 2 days before slicing so they were stiff, but by time I got to the end of the slab they were starting to warm up. They cut MUCH easier when cold. 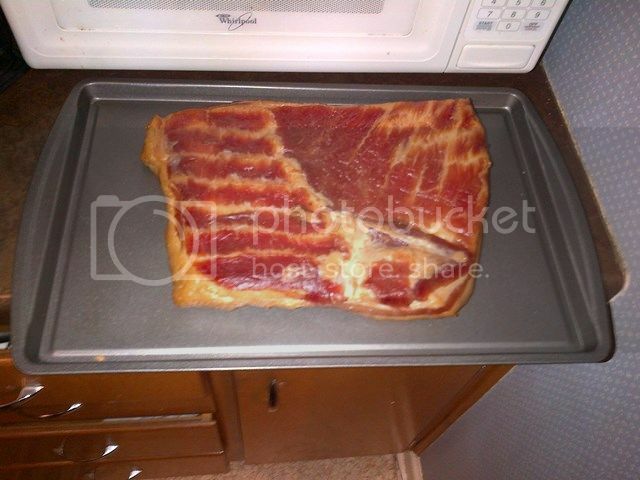 hmmm, might have to look into smoking my own bacon. just to say i have and see how it turns out. That pretty much where it started for me. 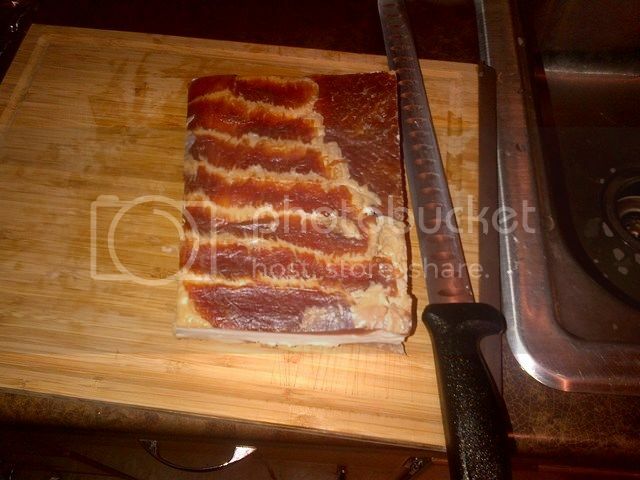 we don't eat a ton of bacon as the wife doesn't care for it all that much, but she gave this stuff raving reviews last night so looks like I'm making more now. Honey bacon next! 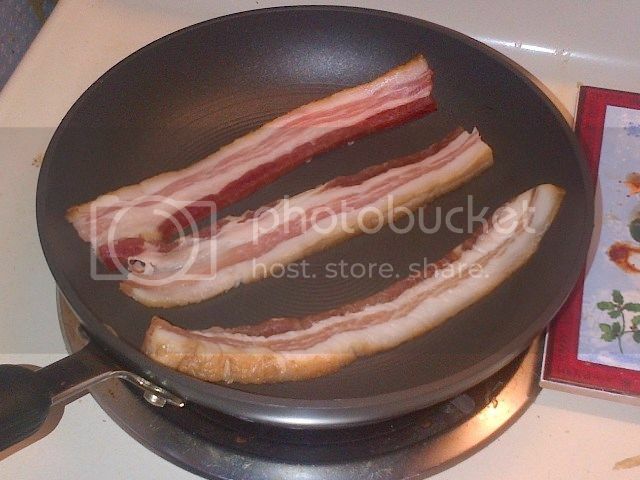 I do care about how meaty the bacon is, but if you make a mistake and buy fatty bacon, make it the way you would the bacon bacon, and then render out the bacon fat, slowly on low heat. 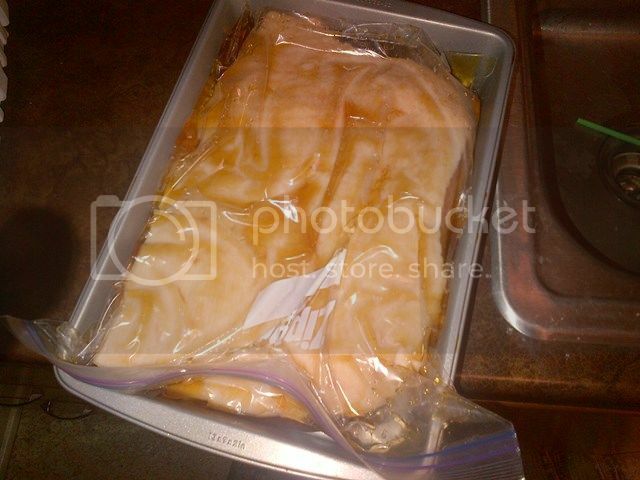 The rendered bacon fat can be used for lots of other cooking, and it will have great flavor. Once the fat has rendered you get some crackling scraps, I like to share them with the kids and the dogs, they are crispy little bits of goodness. exactly what I was thinking. Saved and vaccume sealed some trimmings to render out some lard. If it doesn't bother the dogs, then the kids are normally OK with it!